There are 228 ads today in this category . Semi auto shotgun on AK-47 Frame; Hi-cap Mag; Screw on Comp. Custom Crafted Ithaca XL 900, .12 GA semi, good condition. Universal .30 Carbine semi automatic, good condition. Kodiak Model 260, .22 WMR semi auto. Marlin Model 57-M, .22Mag Lever Action, good condition. Model 900 Ithaca, .20 GA semi auto, great condition. New Frontier, .22 revolver, great condition. Ruger .357 Mag revolver, great condition. Spring Field Champion, .45 Cal semi auto, great condition. Ruger, .30 Cal revolver, good condition. P-30, .22 Mag semi auto, good condition. Colt Single Action Bunt Line, .22 Mag revolver. 22 Rem Special, .22 pump, good condition. BAR-22 .22 L.R. semi, good condition. Win. Model 63 Super Speed; good condition. 22 WinMag. Encore 209x50 Magnum, Nikon 3-9x40 camo scope with mounts, 209 .50 cal. M-66 Super Single .410 Bore, .410 Single Shot. Up Loader .410 3"chamber, good condition, .410, side-side. Traditions .12 GA slug semi, good condition. Marlin Model 60, .22 semi, great condition. Winchester Model 9422M Winmag, .22 mag lever action. Baby Lugaer; Model KGP-68A-380Cal: Rare and in very nice condition! .45cal- Iron sights/ synthetic rubber grip.."Light weight officers ACP"
.45 cal semi-auto- Iron sights/ Ivory Handle "Combat Series"
Model AP9, 9mm semi-auto, good condition. Tec-22 Machine Pistol, .22 C.R. semi-auto, good condition. Croup UZI Machine Pistol, 9mm semi-auto. M1911 Colt 45 A1 US Army Pistol, .45 ACP semi-auto. Super Black Eagle, 12 GA semi-auto, excellent condition. 376 SteyR Scout, .376 cal bolt action, Excellent Conditon. Benelli Super Black Eagle, 12 GA semi-auto, excellent condition. Benelli Super Black Eagle, 12GA semi-auto, excellent condition. Ruger 10/22 Carbine, .22 semi-auto, excellent condition. Calico M-10, .22 cal semi-auto, excellent condition. Colt Sportor Light weight, 7.62x39 semi auto, good condition. Model 950 Beretta, .25 Cal Semi Auto , good condition. Ruger Mark II Target, .22 semi auto, good condition. Model H-D Militery, .22 cal, semi auto, good condition. Auto Mag II AMT, .22 Mag , rim fire, semi auto, great condition. ERMA-Werke Model KGP 68A, .380 semi auto, great condition. Ruger .22 cal Single Six, Revolver, great condition. Model RC3-22M-8 (Made in Argentina), .22 Mag Single Shot, good condition. Baretta .380 semi auto, (Made in Italy), good condition. CAT 1549, .22 Mag single shot, excellent condition. Ruger Mini 30, 7.62x36 semi auto, great condition. Model 94, 30-30 lever action, Collectors Value, excellent condition. Model 66 Carbine, .22 Mag lever action, Collectors Value, good condition. Model 66 sport rifle, .22 Mag lever action, Collectors Value, excellent condition. Browning Model 1886, 45-70 lever action, Collectors Value, great condition. Winchester Model 1894, 30-30 lever action, Collectors Value, good condition. Winchester Model 9422M, .22 Mag lever action, Collectors Value, excellent condition. Model 9422 XTR, .22 Cal lever action, Collectors Value, great condition. SA, .22 Cal revolver, Collectors Value, good condition. Winchester Model 100, .243 semi auto, excellent condition. Colt Lightning, .22 cal pump, good condition. A-Bolt, 22 Magnum bolt action, great condition. 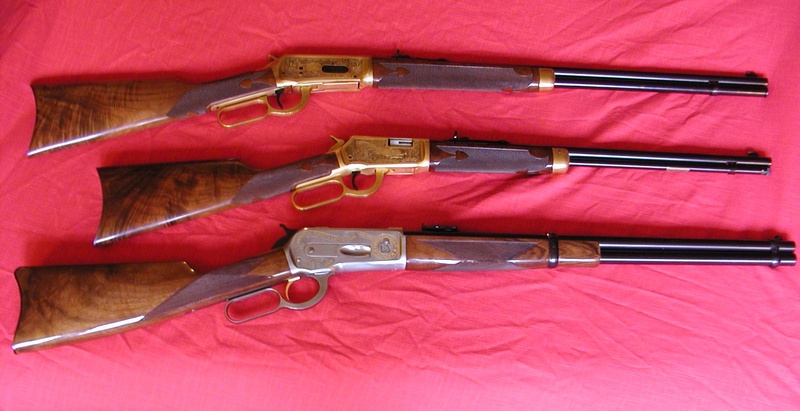 BL,.22 Caliber, lever action, good condtion. Model 1894, .22 WMR lever action, good condition. lever action 22's, magnum model. Zastava EZ pistol, 9mm 4"BBL; 40 SW 4" BBL. 10/22 carbine, .22 LR 18 1/2" BBL 10RD. 4x4 bolt action, scoped combo, .300 win 24" BBL; .30-06 SPRG 24" BBL; .25-06 24" BBL. 4x4 bolt action, scoped combo, .300 wim MAG 24" BBL; 7MM rem MAG 24" BBL. 4x4 bolt action, scoped combo. 33 Sub Compact; 357Sig 3-1/2"
39 sub compact; 45 G.A.P. 3-1/2"
38 Compact; 45 G.A.P. 4"
BPS Magnum; Mossy oak new break-up. Super X3 Classic Field; 12GA 3" 26", 12GA 3" 28". Model PT-140PRO "Millennium Pro" 40 S&W, 10+1 shot, fixed sights, double action only, manual safety. P22/PK380 Talo set w/ case. SP22 M2 .22LR 6" BBL.